Every so often, the same mysterious image seems to pop up on the internet. The black-and-white portrait looks to be at least a hundred years old, and yet, it is of an Indian woman, a Japanese woman and a Syrian woman, sitting in Pennsylvania. 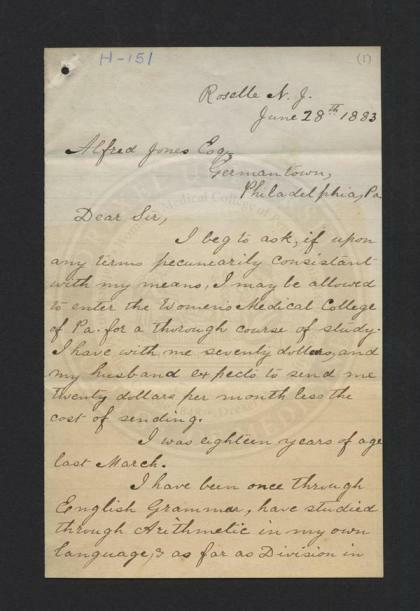 From the Drexel University College of Medicine Archives and Special Collections. The image -- doing rounds this time thanks to Jaipreet Virdi-Dhesi, a Ph.D. student who uploaded the photograph to her blog, having stumbled on it while researching 19th century ear surgery in the Drexel University College of Medicine online archives -- is remarkable enough to warrant the fuss. The three magnificently dressed ladies were students at the Women’s Medical College of Pennsylvania, snapped at a Dean’s reception, in 1885. So how did our seemingly non-hysterical trio wind up inside a medical school? And that too, from thousands of miles away? "It’s a reminder just how exceptional America was in the 19th century," Woolf writes. "We often spend so much time remembering all the legitimately bad things in U.S. history. But compared to the rest of the world, America was this inspirational beacon of freedom and equality." The first women’s medical college in the world, the WMCP was a magnet for ambitious ladies of all stripes. 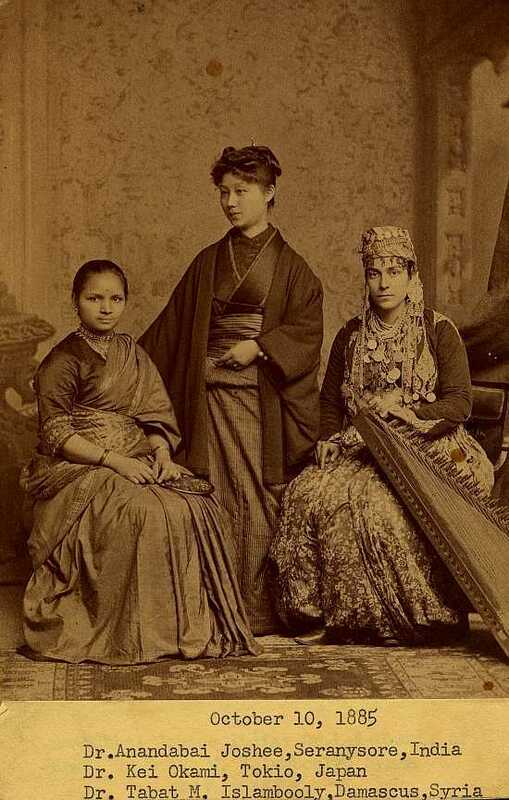 The three in the photograph -- from left to right, Anandibai Joshi, Keiko Okami, and Sabat Islambouli -- eventually became among the first licensed female doctors in their respective countries: India, Japan and Syria. 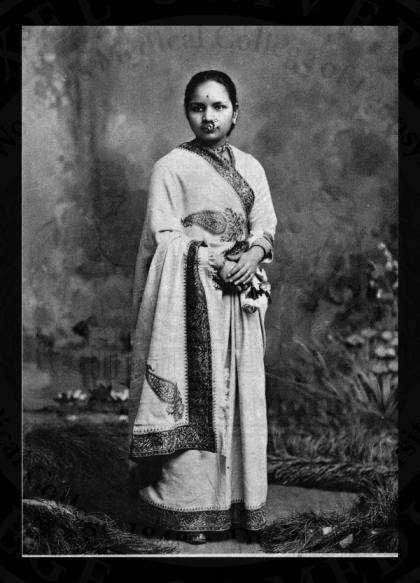 A close-up of Anandibai Joshi, one of three early foreign graduates of the WMCP. You can understand the fascination. On paper, Joshi's life seems hugely regressive, but in reality it was anything but. She was married off at the age of nine, to a 20-year-old man. Unusually, he believed fervently that she should be educated, and took her lessons on himself. Another fragment of a letter Joshi wrote to an executive of the WMCP, asking for admission to the college, and financial assistance. She was well-read, thanks in part to her husband, but not wealthy enough to actually travel to the U.S. and attend medical school. The Oxford Encyclopedia of Women in World History details the circuitous route the couple took to find a backer to send Joshi to America. Fittingly, it was a woman who stepped in: Theodicia Carpenter, a wealthy New Jerseyite who read of the couple in a local Christian paper, after they turned down an offer from an American missionary who promised funds only if they converted from Hinduism to Christianity. Woolf details the hardships Joshi faced even after getting licensed. According to a Drexel archivist he spoke with, India's first female physician died of tuberculosis at 21, too young to ever practice. As for the other two women in the internet's favorite 19th century graduation picture, life wasn't simple going for them either: Islambouli fell off the university’s radar after moving home, an indication that she likely dropped her career. Okami went on to become head of gynecology at a top Tokyo hospital, only to resign when the reigning emperor refused to meet her during a visit to the hospital, because she was a woman. CORRECTION: A previous version of this story relied on the PRI report's identification of the photograph's three women as "the first" licensed female physicians out of each of their countries. Drexel archivist Matthew Herbison tells HuffPost that this title isn't accurate. At least in the case of Keiko Okami, another Japanese woman, Ogino Ginko, "appears to have been the first...to receive her degree." As for the other two women, Herbison points out that record-keeping is by nature a malleable science, and so we can't ever definitively know who was "first." The change has been noted in the text.